I wanted to share a photograph that one of my employees took at a recent football game. 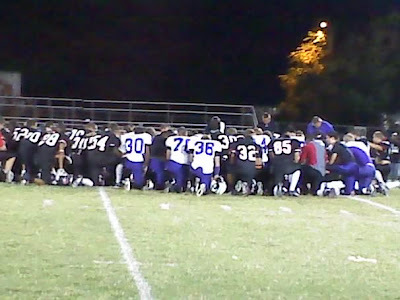 The photo shows many of the players from both the DuQuoin and Harrisburg football team kneeling in prayer after the game. I can’t express how touched I was at the picture. In today’s day and age when both religion and sportsmanship are downplayed, it is heartwarming to see that both are still alive and present here in Southern Illinois. Most of us from SI realize how hard fought the game was between these two power house teams. What a wonderful testimony that they can come together like this after the game. I would love to know who the player or players were that first suggested this gathering. I wish you could encourage other football players from around the area to follow in you example. I am very proud of all of you. Have you entered the Childers Orthodontics T-Shirt Contest? We need your he... Ask Dr. Childers: What should I expect when I get my braces removed?